Our comprehensive bin and liner system allows you to easily collate, compact, store and recycle your farm plastics. The simple system allows you to manage your waste and simply call us to arrange a collection when you have three full liners. When your full liners are collected, we will supply a Waste Transfer note for your records, ensuring our system is compliant with Farm Assurance schemes. The 1800 litre bins (1.25m high by 1.25m diameter) ensure you can fill each liner to capacity, cutting your disposal costs. 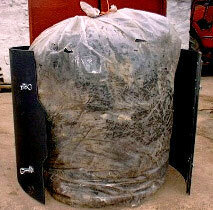 Mini bins and mini liners, ideal for smaller waste streams such as equestrian units or landscapers, are also available. Holding about 200 litres, they are 3ft high and have a 2ft diameter. A free no-obligation three month trial of the bin allows you to test this straightforward system for yourself, with no delivery or collection charge. Assemble the plastic bin (it is delivered as a flat sheet), insert the liner and clamp on the lid. (The entire assembly process takes about 2 minutes as shown on the video clip). 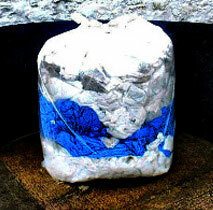 Start to fill the bin with waste and periodically compact the material using one of the various methods such as compressing with a weight as shown. When the liner is full, tie it off with a cable tie and then unclip the bin wall to free the liner. Move the bin, and once the liner is removed the bin can be set up once more and the next liner can be filled. 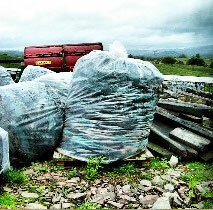 If you have 3 or more liners to collect you can contact us and we will remove them. Our haulier will contact you and arrange a suitable time to collect the liners. Upon collection the driver will complete a Waste Transfer Note and leave it with you for your records. Simply contact us to order additional liners. Packs of five can be dispatched via overnight courier, ensuring you have them on farm when you need them. 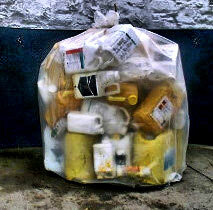 We also supply Mini Bins, which are useful for smaller waste streams. Many of our equestrian units and Landscapers use these. They hold around 200 litres. They stand 3ft high, and have a diameter of 2ft. There are mini liners to fit them and these can be ordered for £7.50 for a pack of 5 (plus £10 delivery). All bags must be EMPTY of residue product.